Until this year I’d not sought out short films. Most of the films I watch are feature-length, brought to my attention by adverts plastered on buses or shown on TV. Unfortunately short films don’t have this mainstream advertising. For a screening to be viable, a collection of short films would need to be created – something that cinemas seem reluctant to do regularly, if at all. 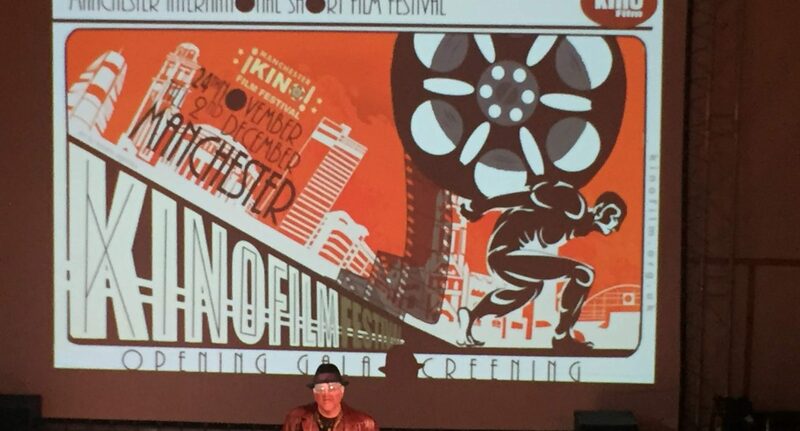 However, Manchester hosts its own short film festival, Kino Film Festival, which collects together hundreds of short films and programmes them over nine days. The festival’s hub was in the N.I.A.M.O.S., decked out with velvety red chairs and ornate décor from the 1900s, and was certainly a suitable location, despite its lack of heating. Wrapped up in all my layers, with a plastic cup of red wine in one hand and some unidentified baked good in the other, I settled to watch the opening gala of this year’s festival. The array of different techniques used amazed me, and Mascarpone was one that stood out for me because of this. It followed the story of Francis, a young man who crashes into the limousine of Mascarpone, a gangster boss. The set for this film was all made from cardboard: a cardboard bed, cars, guns, balconies, all making the film feel whimsical. The set, along with the visual effects, created this surreal world and enhanced the storytelling. Effects included rear projection (when a projection is moving behind the actor whilst being filmed), stop-motion and cut-out projection. Short films also enable stories to be told that don’t need an entire feature-length film of 90 minutes. Another film at the festival, Bridge, shows an encounter between two strangers on a bridge in Scotland. The characters are not given names – the credits were simply “Man: Steven Duffy and Woman: Katy Murphy”. The film was simple and followed a single conversation between two people which might have had long-term beneficial effects on the characters – but, of course, there was no ‘one year later’ clip. The dialogue needs to be carefully considered and concise when restricted to such short length, in this case a mere 10-minutes, which made for an impactful and powerful script. Characters don’t need complex back stories, and a simpler relationship can be created with the audience – which I found refreshing. Sliding Away was a film I found particularly hard-hitting and one that almost brought me to tears. It follows a son caring for his dying father, whilst trying to keep on top of his family life with a young daughter. Sliding Away acknowledges the emotional drain of balancing these two very different roles. It expresses the power of physical affection between loved ones, their unspoken communication whilst comforting one another simply by holding hands. The actors in this conveyed so much with their physicality, gripping the audience in an emotional turmoil. The end of this short was not laborious, but instead optimistic whilst realistic. The final scene shows the pure joy of a father and daughter playing together in a park without any complications. It’s clear to see that short films express different stories and are incomparable to feature-length films, or what are often considered as normal films. Each have their merits, but the variation in a collection of shorts is enticing to watch and the stories shared are valuable.